Friday November 6th 1903 It was a fine day. Got every thing ready and Will took me down in time to get my hat. I had a nice trip. Laura and Edith were at the depot. Jim & Vene had got home an hour before. We spent the evening visiting and looking for things they brought. 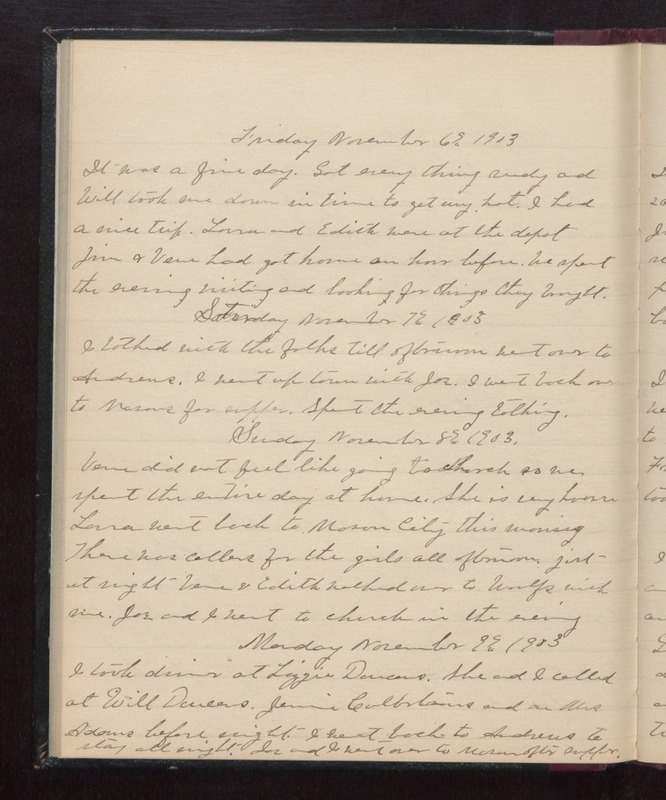 Saturday November 7th 1903 I talked with the folks till afternoon went over to Andrews. I went up town with Joe. I went back over to Masons for supper. Spent the evening talking. Sunday November 8th 1903 Vene did not feel like going to church so we spent the entire day at home. She is very hoarse. Laura went back to Mason City this morning. There was callers for the girls all afternoon just at night Vene & Edith walked over to Woolfs with me. Joe and I went to church in the evening. Monday November 9th 1903 I took dinner at Lizzie Duncans. She and I called at Will Duncans, Jennie Culbertsons, and on Mrs Adams before night. I went back to Andrews to stay all night. Joe and I went over to Masons after supper.